Nokia also reported 9.3 million Asha full touch smartphone sales, for a total smartphone volume of 15.9 million units. This compares with 19.6 million units in Q4 2011 (down 18% YoY) and 12.8 million units in Q3 2012 (up 24%, QoQ). In the light of recent performance, the headline figures for Nokia are positive, with better than expected profitability. However, it's worth noting that the return to profitability should be seen in the context of lower device volumes, especially in high-end smartphones, compared to previous years (i.e. Nokia is operating at a reduced scale in terms of device sales). The overall results were also boosted by strong performance from the networking equipment (Nokia Siemens Network) and location (HERE) divisions. The company will need to demonstrate that it is able to grow smartphone sales from this point onwards (into 2013) if the Lumia and related strategies can truly be considered a success, and sustainable in the longer term. Nonetheless, the return to profitability is an important milestone for Nokia and should ease some of the financial and market pressure that the company has faced in 2012. Nokia's non-IFRS figures (a measure of underlying performance) show a a higher profit (€635 million) than the standard figures, due to one off charges around restructuring (-€236 million) and asset amortization. However they also show that the underlying profit for the Devices & Services division (€52 million) was smaller than the standard figures. This is a result of one-off gains relating to re-structuring (€75 million), a cartel claim settlement (€21 million), the sale of the Vertu business (€52 million), and the sale of real estate (€79 million). Consequently the Devices & Services non-IFRS margin was 1.3% (down from 4.9% in Q4 2011, but up from -7.4% in Q3 2012). As a result of the improved performance, a bond issue, and some disposals in the last quarter, Nokia improved its cash position by €800 million, with the net cash figure now €4.4 billion. This figure has been closely watched in recent quarters as a measure of the health of the company. The improvement in the net cash position will be seen as a sign that the company is well on the road to recovery, although it is still relatively early on in the recovery period. Even with the strong Q4 performance, Nokia's overall results for 2012 reflect the results of the first three quarters of the year, with a operating loss of -€2,203 million for 2012 (down from -€1,073 million in 2011), on net sales of €30,176 million (down 22% year-year from €38,659 million). With the full year results, Nokia announced that its Board of Directors will propose, at the company's AGM, that no dividend payment will be made for 2012, in order to "ensure strategic flexibility" noting that "Nokia's Q4 financial performance, combined with this dividend proposal, further solidifies the company's strong liquidity position". As a result of this announcement, Nokia's share price is down around by around 5% today (at the time of writing). "We are very encouraged that our team's execution against our business strategy has started to translate into financial results. Most notably we are pleased that Nokia Group reached underlying operating profitability in the fourth quarter and for the full year 2012. We remain focused on moving through our transition, which includes continuing to improve our product competitiveness, accelerate the way we operate and manage our costs effectively. All of these efforts are aimed at improving our financial performance and delivering more value to our shareholders." Of the smart devices volume of 6.6 million, 4.4 million were Nokia Lumia devices and approximately 2.2 million were Symbian devices. This was the first quarter in which Lumia (Windows Phone) devices outsold Symbian devices. The average selling price (ASP) for smart devices was €186 (up 33% from €140 in Q3 2011 and up 20% from €155 in Q3 2012), reflecting an increased proportion of higher cost devices (principally, the Nokia Lumia 920 and 820). 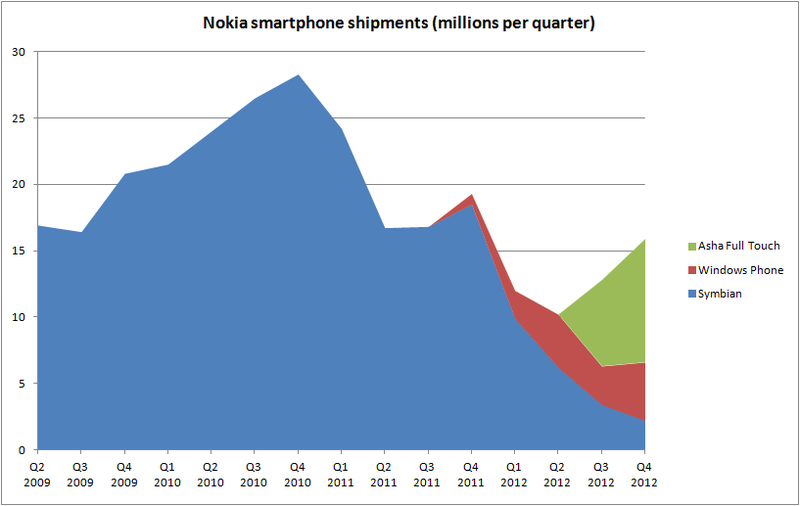 Nokia's Mobile Phone volume was 79.6 million, down 15% from 93.9 million in Q4 2011, and up 4% from 76.6 million in Q3 2012. ASP for Mobile Phones was €45, down from €53 in Q4 2011, but up from €43 in Q3 2012. Nokia's Mobile Phone products continue to drive the profitability of the Devices & Services division, effectively "propping up" Smart Devices activities. For the Devices & Services division as a whole, Smart Devices has a -21.6% contribution margin, compared to a +8.2% contribution margin for Mobile Phones. This is, in large part, due to the relatively low volumes of Smart Devices, as also indicated by the relatively strong gross margin figures (18%), against the operating expenses (€481 million) for Smart Devices. Also notable is that these figures are improved over previous quarters (e.g. -48.9% contribution margin for Smart Devices in Q3 2012), suggesting an improving outlook for Smart Devices. In terms of the geographic breakdown of sales, shipment volumes declined, compared to a year ago, in all regions except North America, reflecting the decrease in overall sales year-on-year. However, device volumes in Q4 21012 were up, compared to Q3 2012, in Europe, Middle East & Africa, North America, and Latin America, suggesting a late-in-the-year trend for improved sales volumes. China sales were sharply down both year on year (-69%) and quarter-on-quarter (-21%), but in the conference call Stephen Elop noted that Nokia was in the process of introducing its new portfolio of devices only at the very end of the quarter and initial consumer demand was "very positive". Nokia noted that sales of Symbian devices were expected to further reduce into 2013. In the results press release there was also official confirmation that, as expected by everyone, the Nokia 808 PureView was the last Symbian device. "During our transition to Windows Phone through 2012, we continued to ship devices based on Symbian. The Nokia 808 PureView, a device which showcases our imaging capabilities and which came to market in mid 2012, was the last Symbian device from Nokia." During the conference call it was also noted that the sale of Lumia devices in Q4 2012 was constrained by Nokia's ability to manufacture the devices (component supply) and that this situation is expected to continue into Q1. Nokia's Location & Commerce division reported sales of €278 million, down from €306 million in Q4 2011 and up from €265 million in Q3 2012. The year-on-year decrease was mainly due to lower internal sales (due to lower sales volumes of Nokia devices). Nokia Siemens Networks reported sales of €3.988 billion, up from €3.815 billion in Q4 2011 and up from €3.501 billion in Q3 2012. Operating profit was €251 million, up from €67 million in Q4 2011, and up from €182 million in Q3 2012. Looking ahead, Nokia expects to see a decline in Devices & Services margin in Q1 2013 to -2% (+/- 4%), reflecting a challenging quarter ahead due to competitive dynamics, seasonality (traditionally sales are generally lower in the first quarter), and the macroeconomic environment. In addition, the Location & Commerce division's operating margin is expected to decline due to lower internal sales, mainly due to decreased deferred revenue from lower smartphone sales in 2012 (i.e lower Symbian sales in 2012).